I have been creating since my mother first put an embroidery needle into my hand (not literally, of course) at the age of six, and now I am in a euphoric dance with colour, painting in what I describe as interpretive realism. My subjects range from landscape, florals, portraits, and animals, and my primary medium is oil, followed by mixed media/acrylics. Please contact me if you have any comments or questions. I do commission work for all manner of subjects, including pet portraits, and my work is guaranteed in that you do not pay if you are not satisfied. I offer one or two day Introduction to Oil or Acrylic painting classes, oil and cold wax, as well as a mixed media play day, individual or small groups, at the studio, or at your home or venue. Contact me. Please take a look at my blog (address below) for current postings, and consider visiting my studio by appointment. Thank you for your interest. 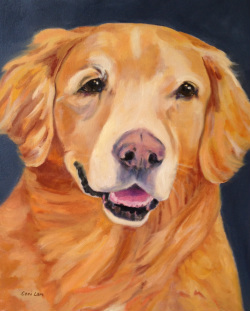 Pet Portraits are the perfect gift for your pet lover.